One crucial part of all of the weddings that we've designed here at DME is, believe it or not, candlelight; LOTS of candlelight! Of course the flowers are typically the main focus, but we feel that the more candlelight, the more exaggerated the floral pieces become. 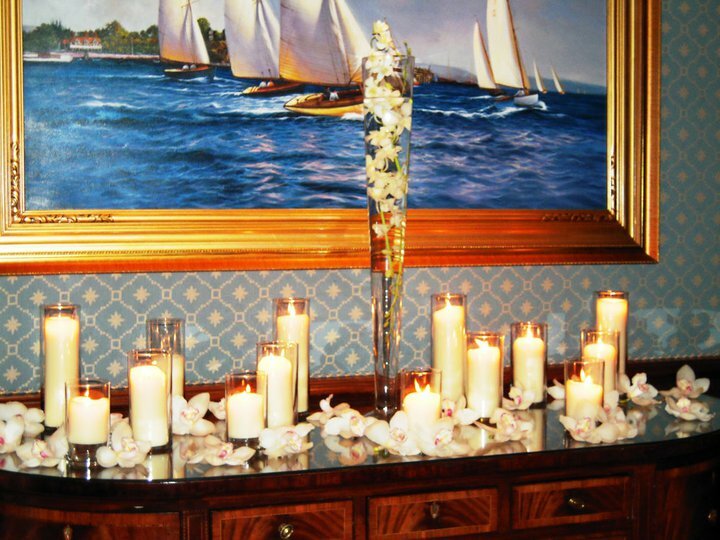 You can have such a variety of design when using candlelight, so no matter what theme or color palate your wedding is going to have, it will always work!! 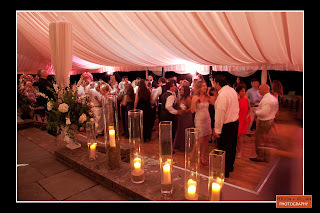 The photos above are by Glenn Livermore Photography from a wedding at Castle Hill that we designed back in 2012. 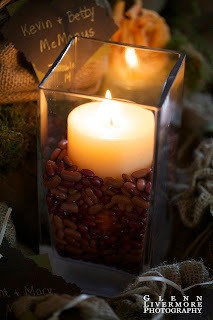 In the photo on the left, we used kidney beans in the pillar around the candle. 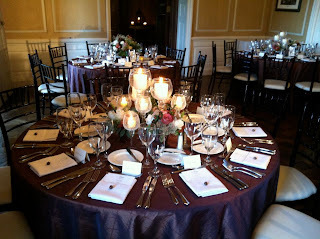 Against the burlap, this design really added a natural but rustic feel to the wedding. Another great thing about this idea - it's somewhat gender neutral, so the guys will love it too! Who would've thought beans could look romantic at a wedding, right? 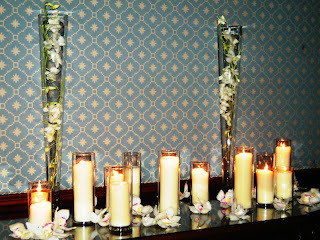 In the photo on the right, rather than place the candles around the flowers, we decided to place them in the middle. I just think this idea is so gorgeous! It's unique, beautiful and also a space-saver on the table! You're probably thinking: more birch!? I know I've really been pushing the use of birch on your big day - but its just so diverse! Here is another great design that gives off a simple, rustic and natural feel. 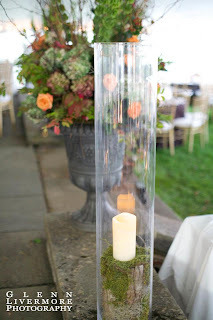 If you want to go for a really lavish look using the flowers at your wedding - opt for moss covered birch in pillar candles! You can still use lots of candlelight, without taking away from your flowers, by keeping it super simple but gorgeous at the same time! Here is a photo from one of the many weddings we've designed at Castle Hill! If you're not a fan of having lots of flowers on the tables at your wedding, here is a perfect way around that! Instead of designing all of your tables to have floral centerpieces, you can do half of the tables with a floral centerpiece and accent candles, and the other half with a cluster of candlelight and accent florals. Also - note the different heights of each crackled-glass with candles. This spruces up the design and also adds great texture to the entire look! The photos above were taken at the Cubist Pharmaceutical holiday party in Boston back in 2011. We used different heights of candlelight for the Welcome table, and scattered Orchids all throughout the glassware. 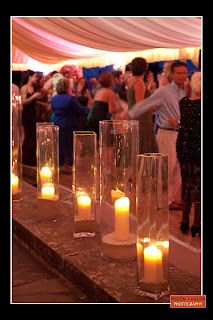 This is a beautiful way to add candlelight to whichever event you are planning. This is another fabulous way to romanticize your wedding night using candles! 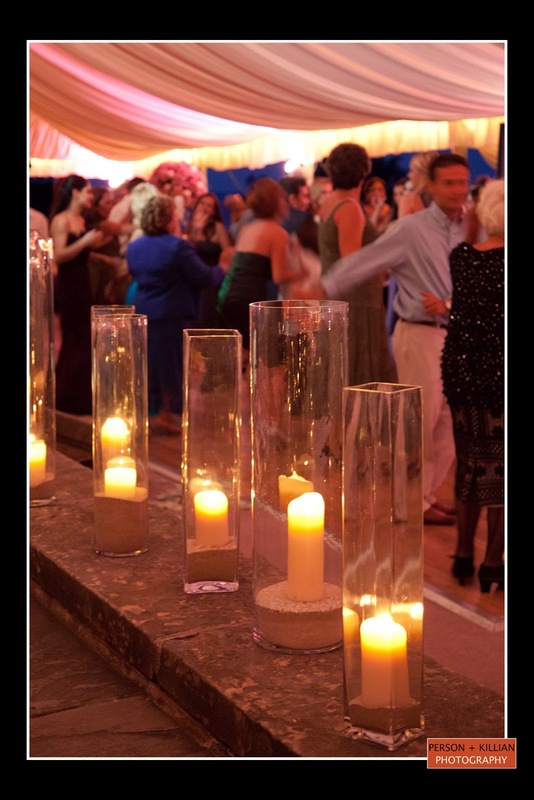 These pillar candles, all different heights, were spread along the edge of the dance floor at the breathtaking Crane Estate. For this breezy summer wedding, we poured a little bit of sand into each pillar to hold the candles in place. This design was perfect for the type of wedding and added gorgeous detail to the overall look. See? More IS better! For you ladies out there who want to romanticize your wedding night - use candles! 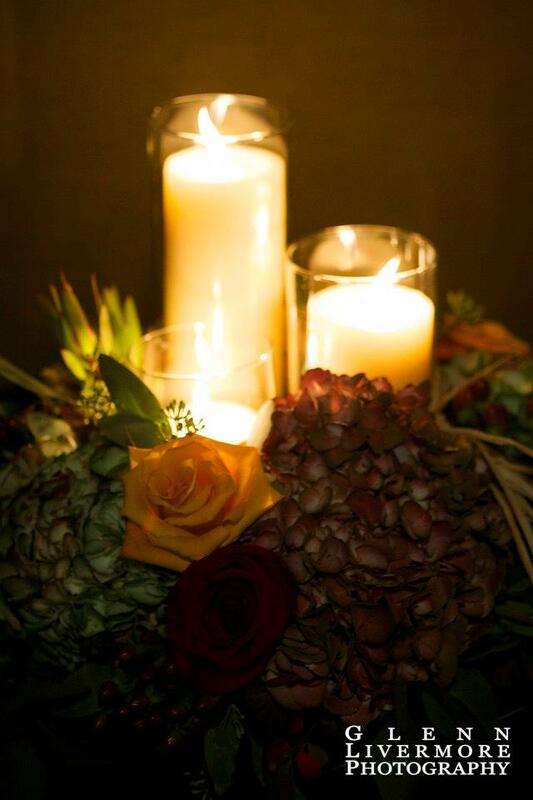 For you men, who aren't huge fans of lots of lavish flowers - candlelight is the perfect way to make your wedding day romantic, while still being able to incorporate a sort of masculine vibe. Either way, candlelight is a must!! !